Premier Inn Heathrow Terminal 4 bookable for £29! New Premier Inn directly at Terminal 4 now bookable for £29.50! On Sunday I wrote about my stay at the Hilton Garden Inn at Hatton Cross. This is a decent budget hotel at Heathrow with one great advantage – you don’t need to use the rip-off and slow Hoppa Bus to get back to the airport, as Hatton Cross underground is just outside the front door. I was reminded in the comments that there is another handy budget option on the way. A Premier Inn is due to open at Terminal 4 in late May. This will have a direct covered connection, via (I think) the same walkway used by the Hilton at Terminal 4, to the terminal. You won’t need to get the Hoppa Bus. If you are not flying from Terminal 4, you can use the tube (apparently free between terminals with Oyster) or the Heathrow Express / Heathrow Connect service (free to all) to get to the terminal you need. Terminal 5 will be a bit of a faff because it will require a change of train however you do it, but Terminals 2 / 3 are easy to reach. Here is the great news. The Premier Inn Heathrow Terminal 4 is currently selling rooms for £29.50 per night. This is an exceptional deal for a hotel directly connected to Heathrow. The hotel will have a huge 613 rooms. Two floors have being allocated exclusively for the use of airline crew and presumably have a different room specification. There is only one Premier Inn hotel that I stay in on a regular basis (Scarborough, of all places) so my experience is limited. The quality of the bed and the room is excellent, however, and puts a lot of older Holiday Inn Express etc hotels to shame. 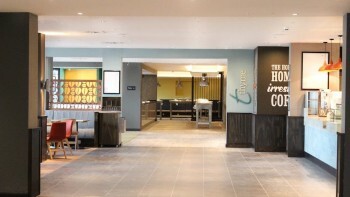 I think Premier Inn has been responsible for Holiday Inn Express raising the design and quality bar quite sharply with its ‘new generation’ hotels now rolling out. The opening date is scheduled for Saturday 20th May. The hotel website is here. £29.50 rooms are available pretty much every day throughout the Summer. Even if you don’t want to commit to a pre-paid rate, fully flexible rooms are just £45 on 95% of nights I checked. This is just part of a mini hotel boom at Heathrow. 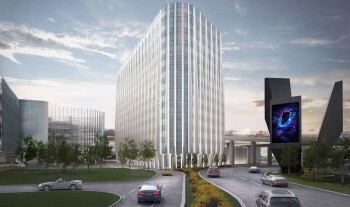 A new combined Crowne Plaza / Holiday Inn Express will also open at Terminal 4 next year (see photo above) and will also be walkable to the terminal. but no operator has yet been selected. 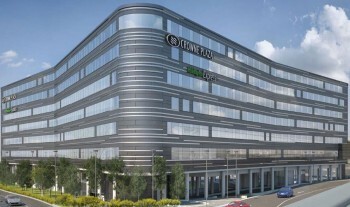 Plaza Premium is also opening a hotel under its Aerotel brand later this year in a converted office block which will be directly connected to Terminal 3. Part of the reason for this building spree, of course, is that all of the hotels on Bath Road – which account for the majority of the accommodation at Heathrow – will be demolished as part of the third runway. Bits: 2400 Avios with Tesco Mobile, Qatar Airways launches Cardiff! (BACK IN STOCK) Quick deal: Under 1p Avios or Virgin miles with a BT phone from Tesco! Could anyone tell me what’s the point of an Airport hotel? Unless you miss your flight or have an lon connecting flight? depending on the rate can also be used for meetings just due to convenient location to many. Albeit with expensive parking if not parking at the actual hotel. Some of us live hours away from Heathrow (2 in my case – if there are no train problems, which there regularly are). If you have an early morning flight and you’ve got to allow 2 hours at the airport and 2 hours traveling time you end up having to get up in the middle of the night. Much nicer and less stressful to arrive at Heathrow the evening before and get up at a reasonable hour the next day. Though only if you get a decent night’s sleep in the hotel, which admittedly I usually don’t! I live 4+ hours from Gatwick but the BA flight I wanted to use the 241 voucher on only does from there. I didn’t fancy a 14+ hour journey to start my hol (4+ hrs driving, 2 hours at airport, 8hr flight) so booked a hotel overnight to start the hol in a better frame of mind. Also, no risk of missing my flight due to accident on the motorway! I like to stay the night before even though I live in London, otherwise I am at the whim of southern trains to get me there on time on the day. Plus I think it adds to the holiday and certainly extends my clubhouse time. Nice relaxed start to an early flight rather than panic? or nice relaxed end to a great holiday before life begins again? I did a Hilton T4 a couple of years ago despite only living 40 minutes away, because my Mrs put her foot down about being woken at 4am. To be honest, I would have appreciated it if she’d stayed at Stansted last night instead of waking me at 5am before getting a taxi up there for an early Ryanair flight to Bremen. Can anyone help out here and talk me the cheapest and easiest route from Hilton T5 to Terminal 3 for Saturday morning? There’s 4 people. I’d take the Underground personally. Free if you each have an oyster card or a contactless card – it’s charged at zero. You still have to get from Hilton T5 to T5….and that isn’t going to be free. I got the T4 Premier Inn for 42 quid at the end of September. Hilton T4 was charging £230 and Sofitel T5 £245 for the same night. I stay at Premier Inns for work and they’re a decent basic brand where you know what you’re getting. The automated approach to check in and check out (using touch screens) should see shorter queues for all except IRROPs bookings and I find their staff to be consistently friendly and pleasant. In fact the only bad stay I’ve had at a Premier Inn was the one time where I got there to find the hotel had been closed that morning for emergency fire suppression system work – they’d already rebooked me into a Premier Inn 15 minutes walk away and paid for a cab to take me there. I’ve had mixed stays at Premier Inns, from very good to awful. They are like most hotel chains in that respect but certainly no worse than holiday inns overall for a nights sleep. During one of Southern Fail’s many strikes last year I was forced to pay £120 to spend a night in Worthing Premier Inn. You know the hotel was clean etc. but that’s not a “budget” price and it still was a pretty budget experience. In the past hour I’ve received two separate email witb avios logos etc confirming transfer from something called abas and ucount. I have never heard of these and email contained no personal information. Take care not to click any buttons in these emails and just delete them if received. Confirmed on twitter that they were sent in error, supposed to be for Avios South Africa customers. They say no accounts compromised. Just a mail shot extract SNAFU! Strange… took advantage of the T4 Premier Inn deal earlier and bagged a £35 room in July the night before an early flight. Went back this evening to book another room, this time in August, which I saw earlier was £29.50. But now the T4 hotel has disappeared from both .com and app. nope, worked fine 4 me. Booked a date in Aug via the website linked in this article. 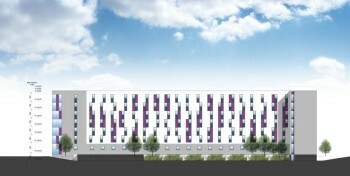 Does anyone know how much the parking will be and how to prebook it for this new hotel? There is no parking. The website says this in small print at the bottom. You’d presumably need to book a cheap deal via Good To Go at T4 (see my sale article yesterday on them) and then walk to the hotel. Wish we had the US system where every airport hotel has a free shuttle bus to the airport. That hoppa is just a pain – it’s almost easier to stay somewhere on the Piccadilly line.